THE longest month of the year will feel a little shorter this week but I’d rather wait another month for the season to begin than watch this kind of rubbish. 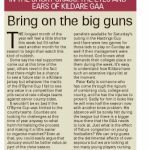 Some say the real supporters come out at this time of the year, others revel in the fact that there might be a chance to see a future star in a Kildare jersey but whatever the merits of the O’Byrne Cup I fail to see any value in a competition that pits second-rate college teams against senior county sides. It wouldn’t be so bad if the O’Byrne Cup was limited to the county teams. Counties are looking for challenges at this time of year anyway so what harm formalising the process and making it a little easier to organise matches? Even at that, you could easily argue that January would be better value as part of the close season. It’s amazing to think that a couple of years back, the GAA decided to omit a number of teams from the Qualifiers if they couldn’t prove their competency in the league. I remember Mick O’Dwyer rightly having a bee in his bonnet as Wicklow were one of a number of sides thrown into the Tommy Murphy Cup instead. Yet here we are in 2014 looking at the kind of team that would struggle to hold their own in a club championship. Shouldn’t the various third-level institutions afforded the right to play in these tournaments at least have to prove they’re capable of competing? And I might add they should be capable of competing without having first call on county players, as is currently the case. When our clubs aren’t even afforded that right, I think it’s nothing short of disgraceful that colleges are given such preferential treatment. This is only a recent phenomenon yet the rise in the status of college football seems to have happened parallel to the increasing disregard for the club game. I can’t recall the Sigerson championship ever being put on hold because of inter-county games yet it has become routine for club players to stand on the sidelines during the summer. If the college game, which has only really come to prominence in the last 20 years, can have such robust structures why then is the club system so fragile? At least the Football Review Committee have suggested annualising the GAA schedule but that will not address the congestion problems during January, February and March. Some of Kildare’s players could have played for one of three teams at the weekend. The under-21s had their senior panelists available for Saturday’s outing in the Hastings Cup and there were two games for those lads to play on Sunday as well if their management were so inclined. God knows what demands their colleges place on them during the week. It’s easy to understand how Kildare have such an extensive injury list at the moment. Peter Kelly is someone who has come through the rigours of combining club, college and county, and he has the injuries to prove it. Sadly for him it looks like he will miss half the season now with another knee problem. His absence will be sorely felt during the league but there is a bigger issue there that the GAA needs to look at. Just what is the effect of fixture congestion on young footballers? We can only guess at the detrimental effects of over-exposure but we are looking at too many young players nursing serious injuries to continue ignoring the problem. Thankfully Jason Ryan has plenty of players pushing for places in the interim. Sunday’s victory against Athlone was nothing to get excited about there was a collective appetite among the squad that was noteworthy. You’d expect the new guys to be hungry for the ball and eager to impress but there was no shortage of effort from the established players either. Mick Foley was as driven and determined as I’ve ever seen him at full-back while Eoghan O’Flaherty ran amok at centre-forward. Of the many positive attributes Kieran McGeeney instilled during his time, the players’ effort and enthusiasm was always chief among them. He rarely put out a side that did not leave everything on the pitch. It was obvious from the work-rate of players that there was huge competition among the squad. Jason Ryan seems to have safeguarded that element over the winter, which was important given the acrimonious end to 2013. Every player made a positive contribution during Sunday’s victory, which is about as you could hope for, while the likes of Mick O’Grady, Conor Tiernan, Adam Tyrell and Darroch Mulhall showed that they are well worth a look during the league. The sooner the more serious stuff comes around, the better. The likes of Mick O'Grady, Conor Tiernan, Adam Tyrell and Darroch Mulhall showed that they are well worth a look during the league"